We're working on a bunch of big features but weren't ready to announce them today. However we have also been working on our Example System and put its new home online here. 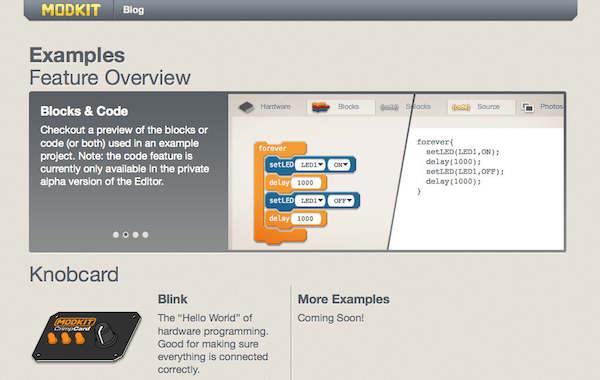 Like our editor, our examples include Hardware, Block and Code views to show you how to connect and program the example projects. There is also a media section for additional photos or video to get you started and you can load the projects in the editor, right from the example page. We'll be adding a few new examples this week, but figured we'd keep you updated on this work in progress. Stay tuned for a big announcement in the next week or two.